A beauty on the way to me (Update: arrived! See the post from 12 Dec 18 with new picture of cleaned brush). When the brush arrives, I'll post the dimensions and after-clean pics. In the meantime, here are some pre-delivery pictures. Nice score Shaun! I have a Kent B26 as well, with it's original box even. Unfortunately my decal is half missing and the knot is pretty "scritchy" but still worth using. I don't believe I have any pictures of mine but I'm sure I can find some time over the long weekend to do so, maybe I can update my brush addiction thread finally. (11-20-2018, 10:48 AM)blzrfn Wrote: Nice score Shaun! I have a Kent B26 as well, with it's original box even. Unfortunately my decal is half missing and the knot is pretty "scritchy" but still worth using. I don't believe I have any pictures of mine but I'm sure I can find some time over the long weekend to do so, maybe I can update my brush addiction thread finally. Ok. 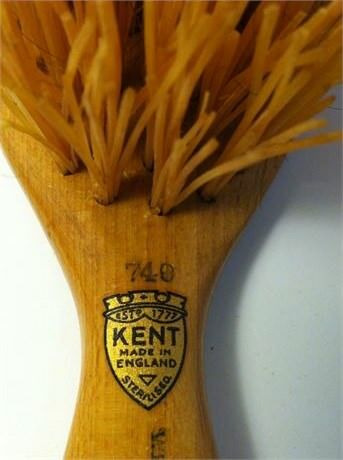 Here's a posting about a Kent hairbrush with a sales slip dating March 1954. Note the decal. 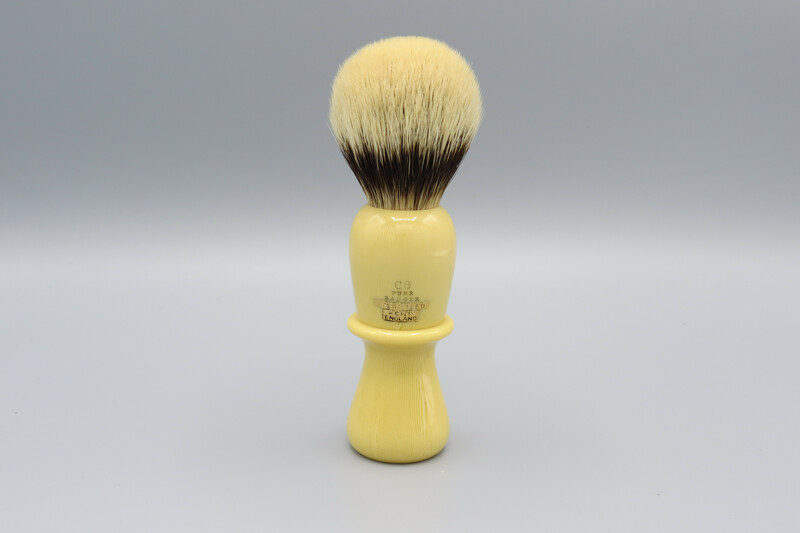 Same as the shaving brush. Note the S in "Sterilised' followed by the fullstop. A little left-field, but a bit more dating evidence. There is, however, no photo date. Would anyone like to speculate? Looking late 40s to me... unsure. early 50s? 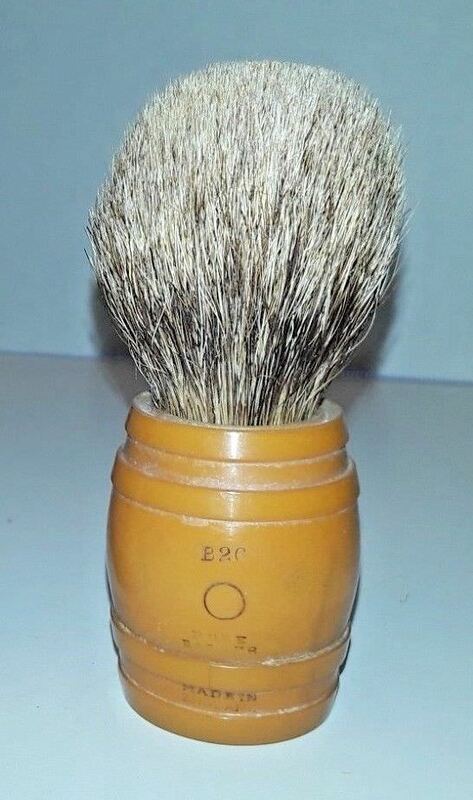 I'd love to see some barrel shaped brushes come out. A Simpson (Hoffritz) is the best one I've seen. I'm not sure on the time period, but I had the thought to ask my mom when she thought the picture was from it was as she might recognize the style of advertising or something like that as she was alive during the suspected time. She thinks from the lady's hair style it was the early 40s. 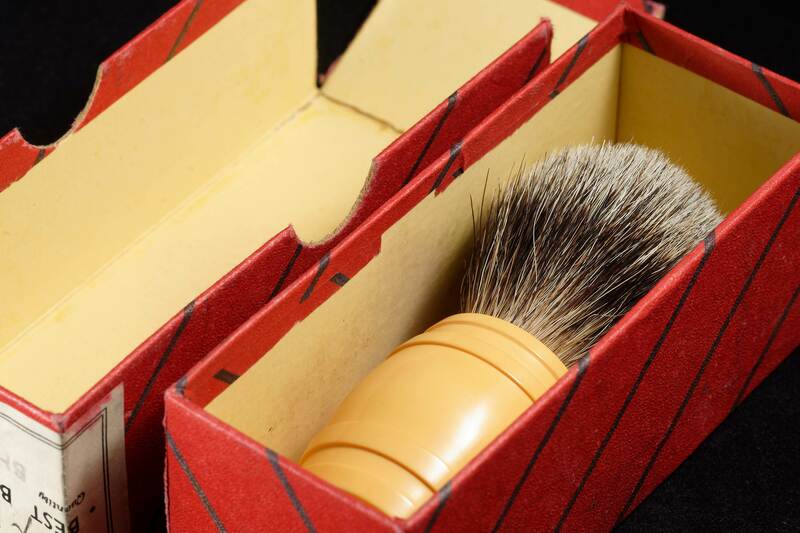 Added: After my post I was looking at the photo more, and I realized that in the case just below the brushes is a box that looks quite familiar. 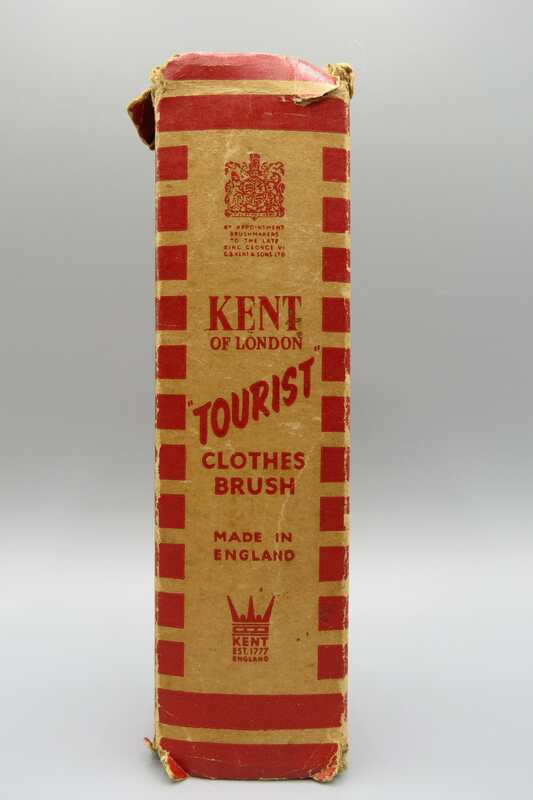 I bought a small Kent travel clothes brush years ago that is in fairly good condition in a Kent box, and the middle box there to my recollection looks just like the size box and the box my brush came in. I tried to find that box just now but couldn't. I'll try to put that high on my list and get a picture of both box and travel brush together, and see if that can help in any way. Have you tried contacting Kent for any information? I did contact Kent, but they haven’t written back. (Update: Kent did write back. Follow the thread. It’s interesting). I have a friend who is a stylist and works in the film industry who has put the hairstyle and blouse to the early 50s. All seems to point to that time, but I really appreciate your input. Maybe Kent will communicate? I agree the Hoffritz barrel looks great, but it’s all a matter of preference, I guess. Personally I like the Kent barrel because it looks like ... a barrel ... in much the same way as the Simpson Milk Churn looks like. ... a milk churn. And yes, wouldn’t it be great to see some barrel handled brushes here in this thread! My continued digging was successful! I noticed on the back just now the K99. I had never noticed that before. 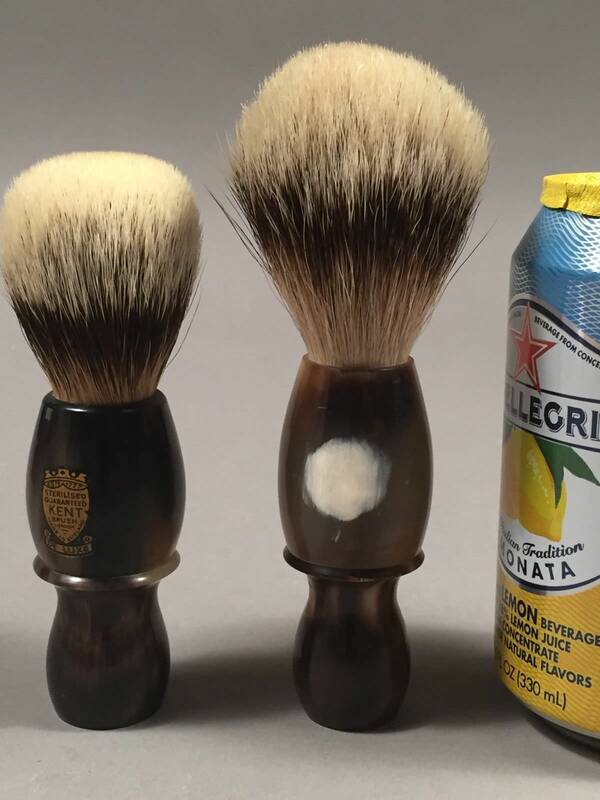 Perhaps it is the model number of the brush. I see numbers on one end but it appears to be 002 under a loupe. Some finish is damaged and removed from the number, but I'm certain that's it for that. 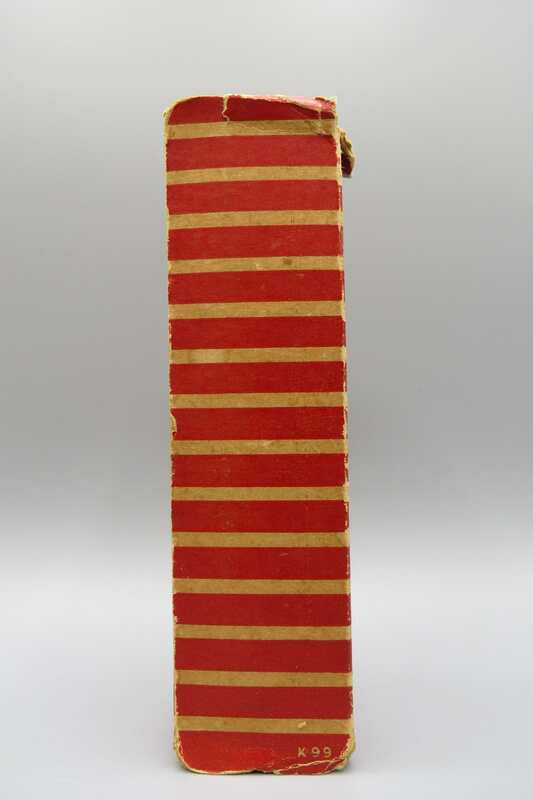 Measures about 5 5/8 inches long by 1.5 inches wide with bristles about half an inch long. It's hard to tell from your sales photo, but it seems like the middle brush lettering says 'Tourist'. 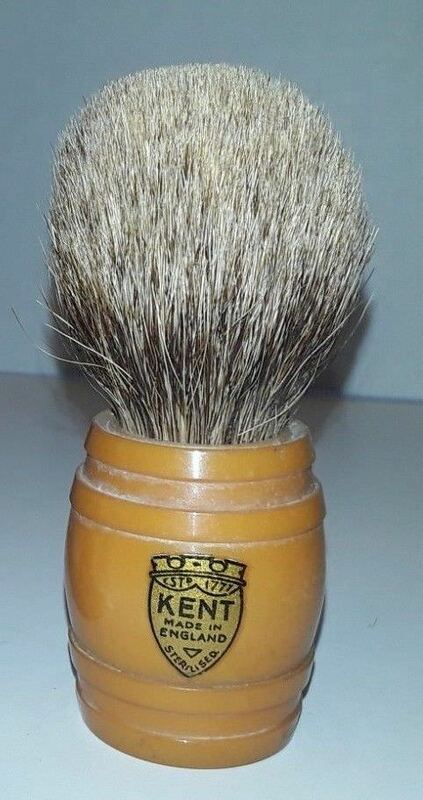 I'm going to contact Kent and see if my photos can get an estimation of when the clothes brush was made. One tidbit on this I forgot to include is that it says Bristle & some other word. I was between Duraton or Durakon. I just finished e-mailing Kent, and the thought occurred to me to search both words with trademark. 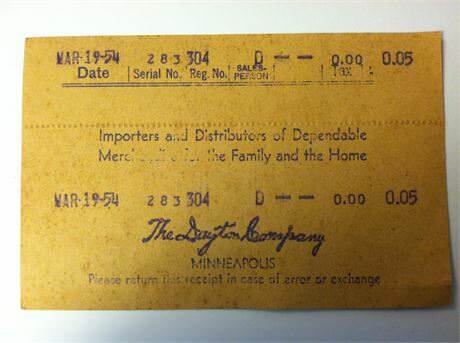 Duraton came back as Kent having filed for the trademark Duraton on 1951-02-24. 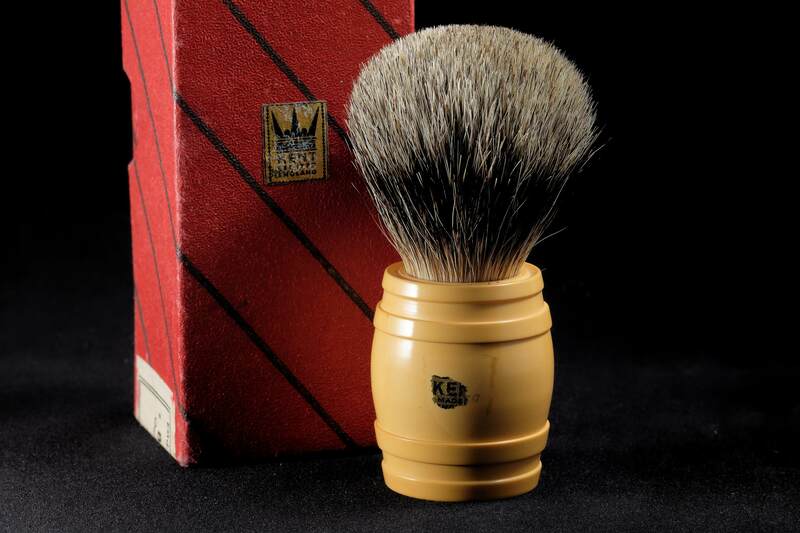 Joe; the royal crest on your brush package states “the late King George VI”. He died in 1952, and Elizabeth was coronated in 1953. 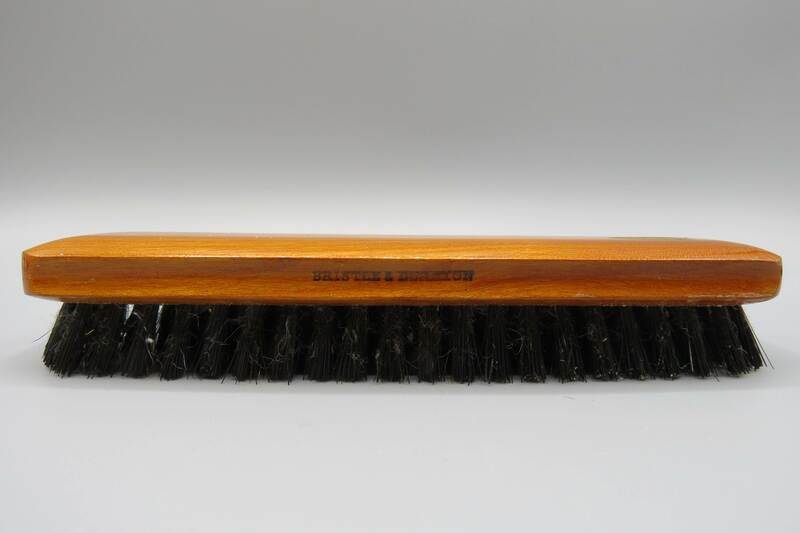 My picture of a clothes brush has the same decal, which is dated to 1954. I think we’re talking early 50s. It’s coming together. Congrats on a terrific catch, Shaun! The maker did a VERY nice job turning that handle. I say that because getting clean cutout "hoops" can be a little tricky. Enjoy!!! Here is my Kent B26 along with it's original box. Note the matching price on the base of the brush and the box. 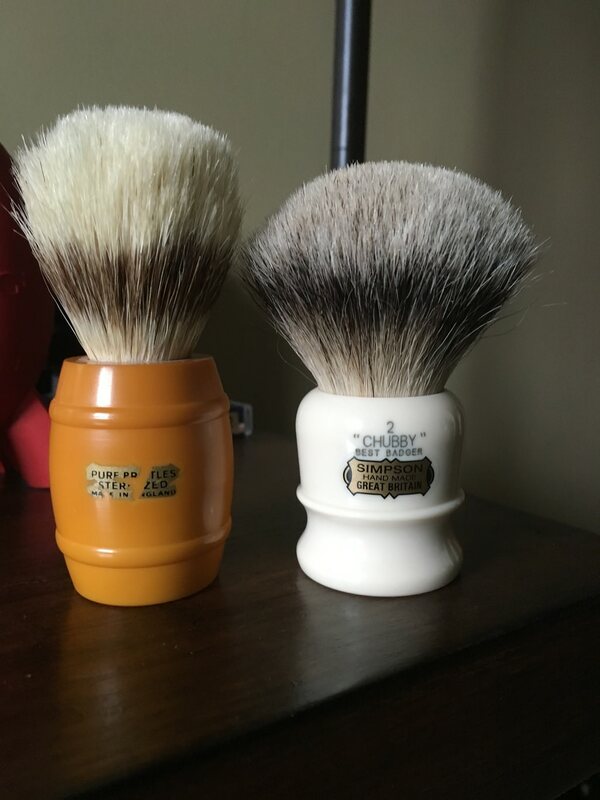 I haven't had time to do any research lately, I have several "new" brushes that I'd love to find more information on, but priorities are not allowing me to. I don't know that this will help you much Shaun, but I hope you enjoy the pictures. Wow, Dave; that's pretty impressive! 55 shillings! That's two pounds and 15 shillings. In 1952-53, that was quite a bit of money. The box is as great as the brush itself!! Thanks for retrieving it and posting it on the thread! 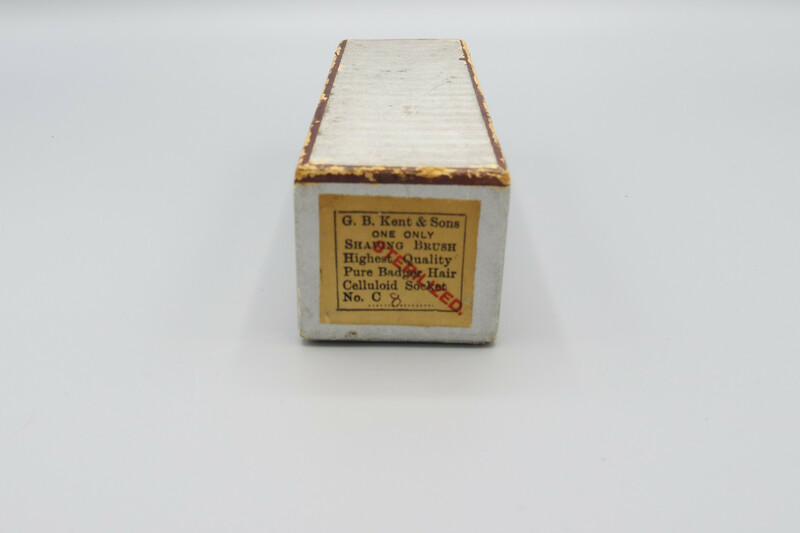 Update: G. B. Kent granted a Royal Warrant by Elizabeth II in 1955. 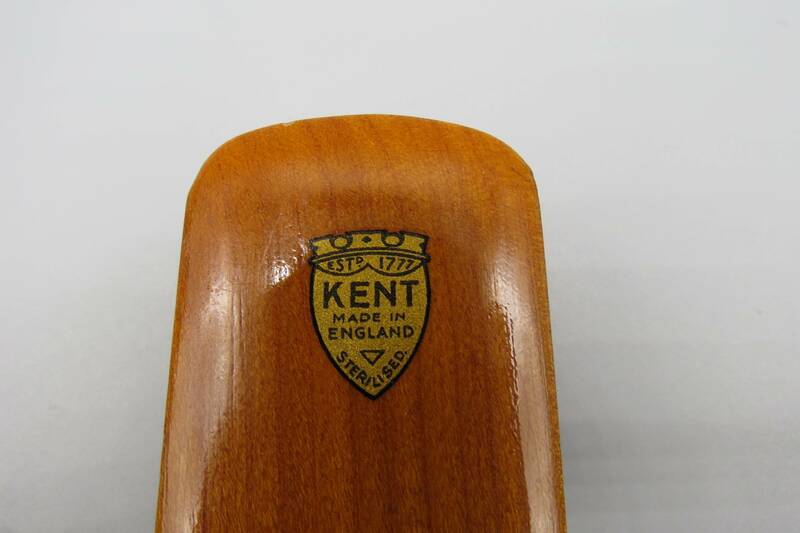 I’d venture to say that Kent would have been keen to advertise this fact and ‘modernise’ their packaging/boxes with the newer Royal crest, even if that meant putting slightly older stock into new boxes. 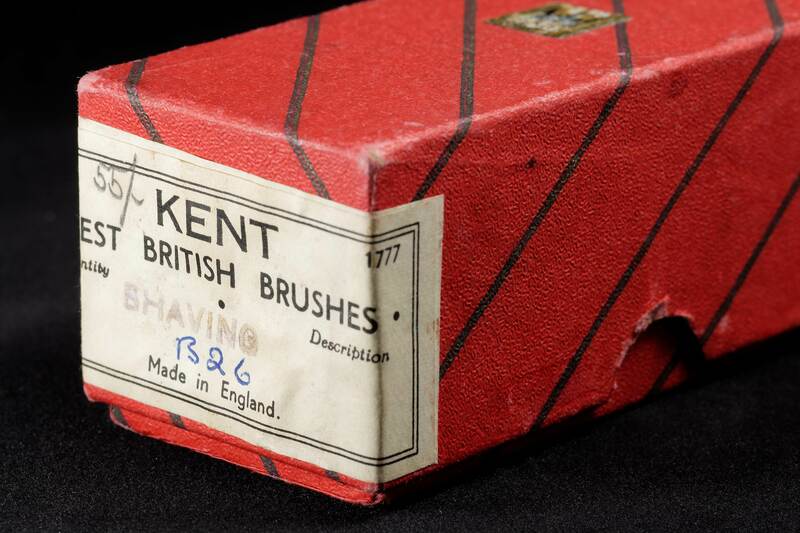 I’ll see if I can find examples of Kent brushes in boxes with either George VI or Elizabth II warrants. These brushes are incredible. Talk about great finds out in the vintage department at your local hardware. LOL (yes I realize a bit more than that). Found another but incorrectly called a “P20”. Easy mistake given the somewhat faded lettering, but this Danish chappie has provided all the dimensions! Good news! 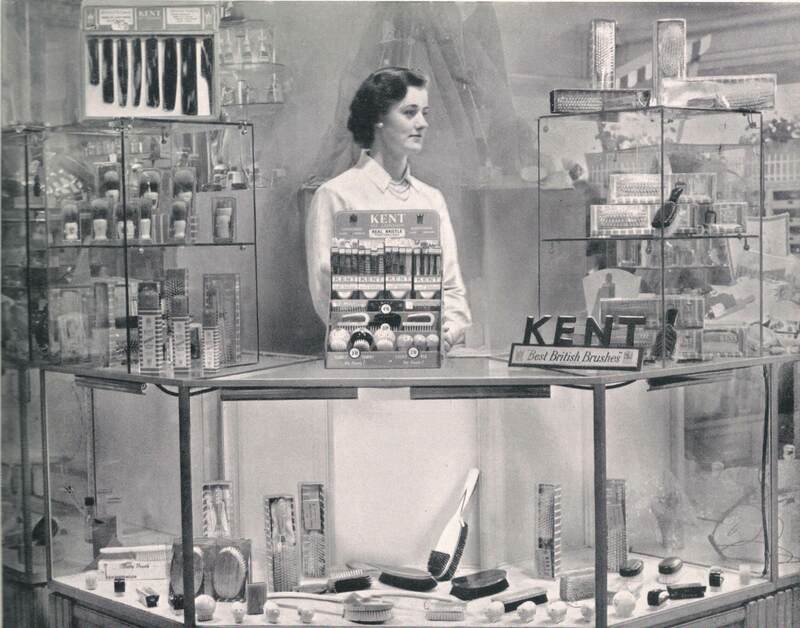 I received a reply from Kalie at Kent in the UK who sent me a few pages of the Kent catalogue for 1930. I have attached these. 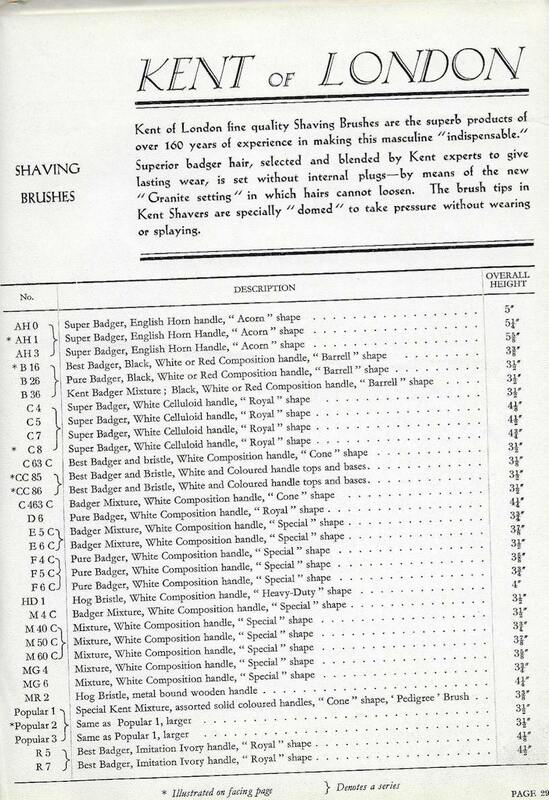 You will see there is reference to a number of brushes; the ones in the list marked with an asterisk are shown in the accompanying photograph (but not all of them are present in the list). You can see reference in the list to three (3) 'Barrel' shaped brushes: B16; B26; and B36. These are each identical in dimension, but come with different hair mixes. That is the only difference. The photograph shows the B16 model. 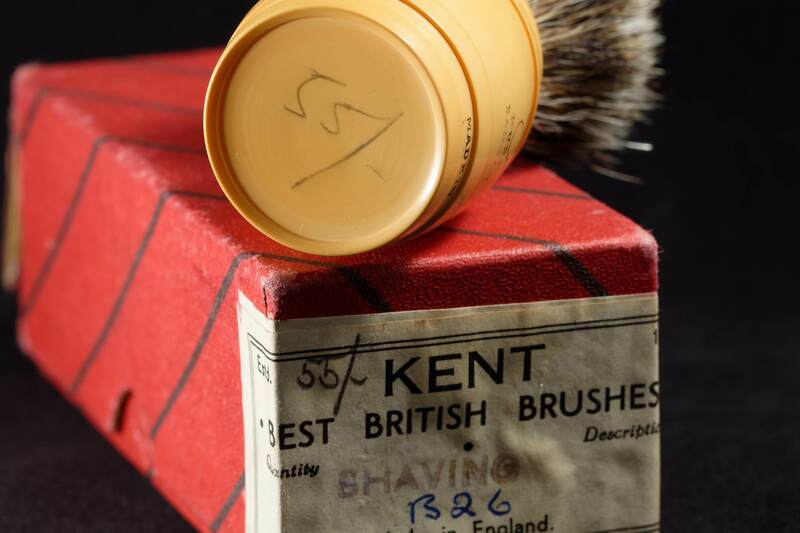 What you can also see is a range of other Kent brushes, and I think this may prove a very interesting reference for those in our community who possess or will come into the possession of Kent brushes for which they do not have historic records or know which model they have. 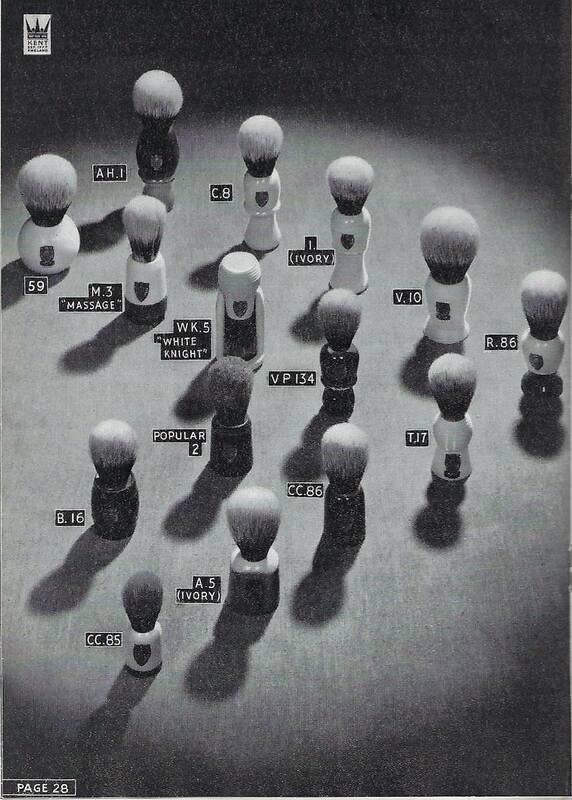 Remember: this is from the 1930 catalogue! As for the B26 - What Dave and I have (and Søren in Denmark) are later versions of the B26 Barrel - which I am putting at 1953-54 - and have different hair. 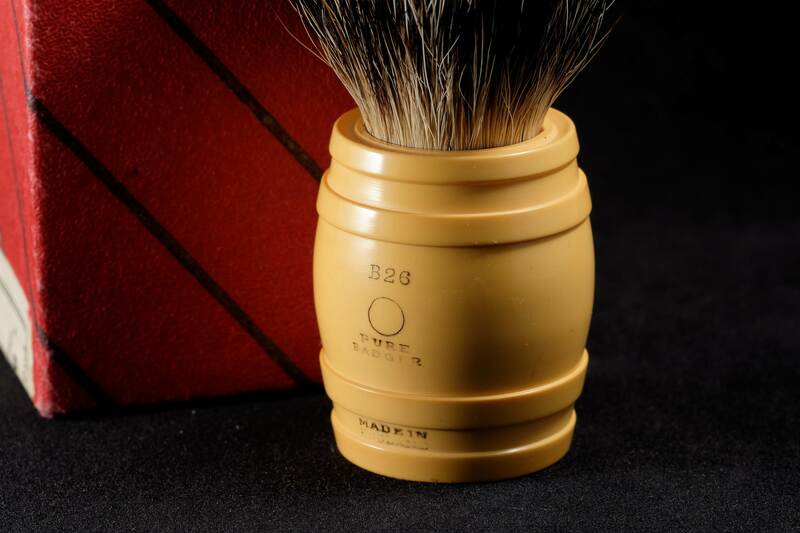 Our brushes are "Best Badger"; the 1930 B26 is "Pure Badger". The B16 pictured is "Best" but seems to have beautiful Silvertip hairs. That would be a great brush to own, no doubt. 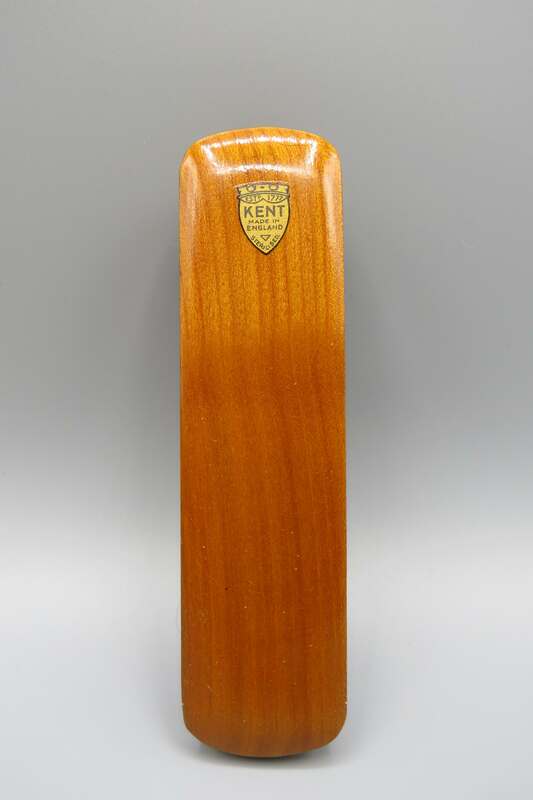 Kalie has let me know that Kent does not have one of these brushes and would love to buy it for the Kent archives... so if you come across one, and want to sell it, then let Kent know. The other difference is that the 1930 B-26 is taller at 3 1/2 inches or approximately 88.9mm overall height. The 1953-54 B26 has an overall height of 86mm; a difference of 2.9mm. Also note in the list the misspelling of “Barrel” as “Barrell” - unless the lathe operator’s surname was indeed “Barrell” and they made a little visual pun on the name! Not completely out of the question. 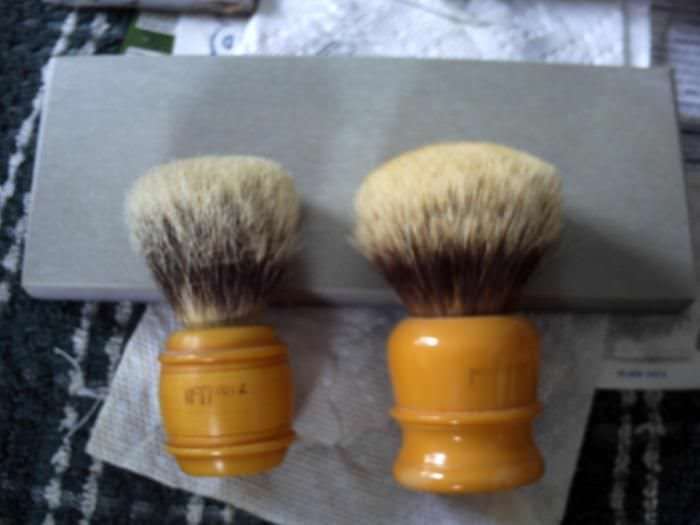 I got a reply back from her as well and she places the brush as a CC2 made approximately in 1950, so I think you're right on with your assumption of when your brush was made. Thanks for sharing the photos too that she shared! I saw the AH1 on eBay awhile back fairly recently with what is likely the AH3 as it is larger. I personally had the C8 for a time and never used it. 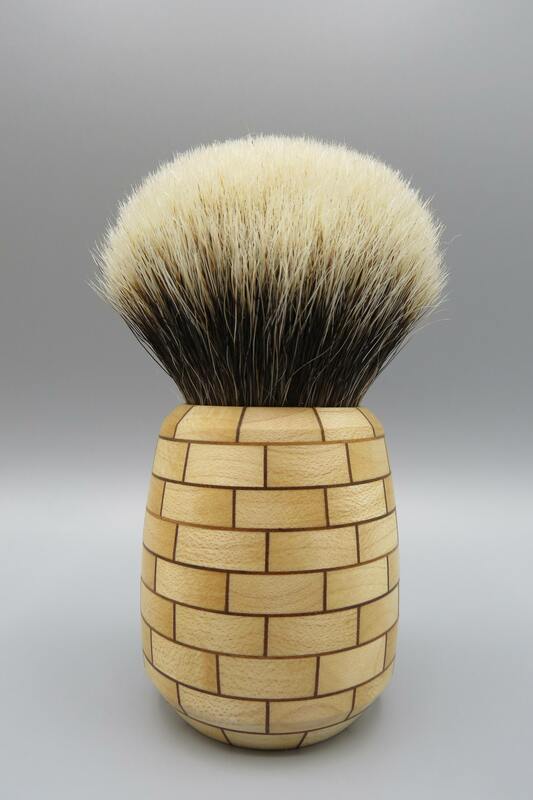 Beautiful brush and I still have the photo graphs to remember it after selling it. I remember the selling noting to me that it was made in 1923. I imagine he contacted Kent for this information, but I forgot to ask him. I've seen a 59 in drP's collection photos before as well. His has a different shield logo and a much larger knot, but you know that it's in that line of brushes. Just a wonderful treasure trove there that you've shared! Joe, great brushes! Thanks for making this thread so much more interesting! It’s all been a great read and interesting little reasearch project too. I hope others will chime in with other obscure Kents. (12-01-2018, 03:22 AM)Shaun Wrote: Joe, great brushes! Thanks for making this thread so much more interesting! It’s all been a great read and interesting little reasearch project too. I hope others will chime in with other obscure Kents.